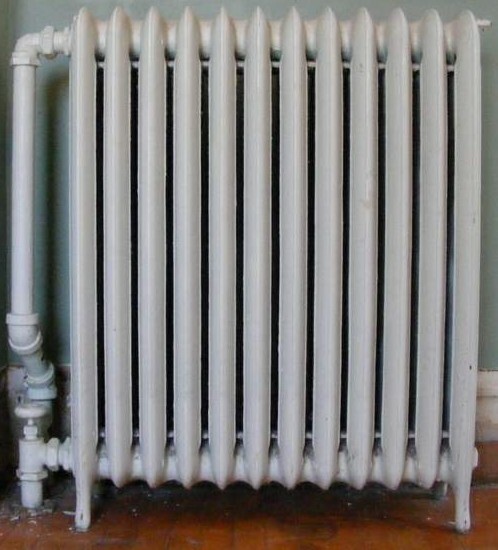 Catch you later, radiator! I’ve never felt more alive! A strange thing happened today that left me with an unfamiliar feeling. As I mentioned before in This ‘n’ That, the radiator in one of our bedrooms needed to be swapped for a smaller one. I did it today. There was a plan, and everything went according to that plan. I don’t remember that happening before. 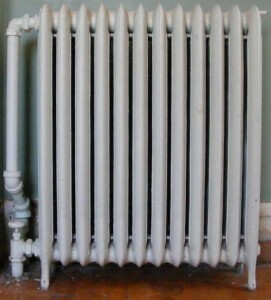 This radiator was too big. We were going to have a heating professional do the job for us. But three quotes came in that were very similar, and way more than we were willing to pay. So we decided to do it ourselves. This was all new to me. I had never worked on a heating system before. I didn’t know how to drain down the system, and I was even unsure about how to turn off the boiler correctly. 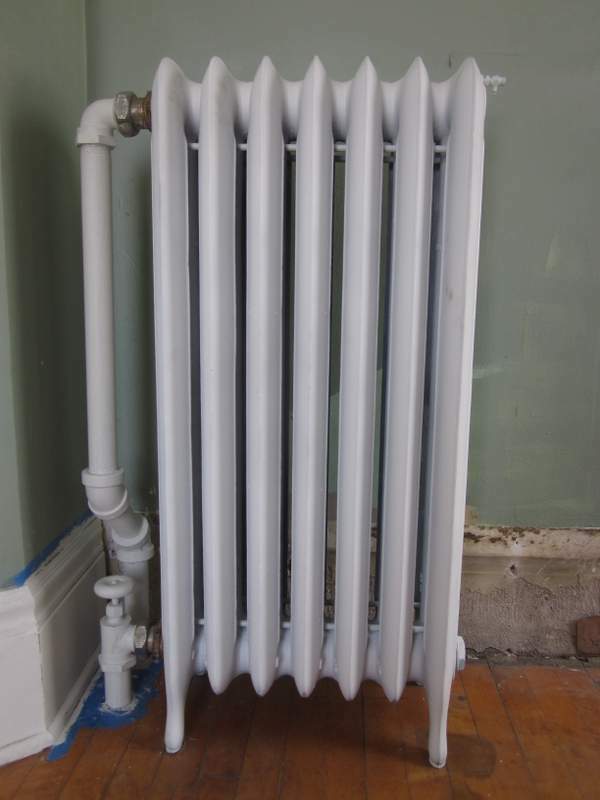 I did all the research, read everything I could find about how remove and install radiators. It didn’t seem that hard. I couldn’t see any reason we shouldn’t try it ourselves. Unscrewing the collars from the pipes. We went to Menards yesterday and bought a few things that we thought we might need: a key to bleed the radiators, some thread paste, and a length of hose to go from the boiler to the drain. 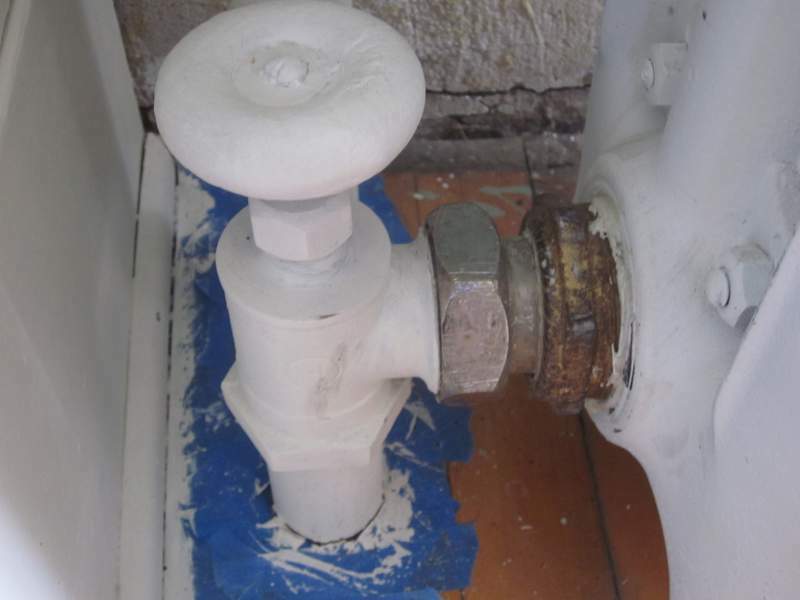 We had heard that we would need to replace the valve and elbow. I couldn’t see why that should be. But anyway, we went and found a plumbing supply place (remember Love in the Time of Radiator Repair? ), and checked that they stocked any bits we might need. They did, which meant I could run over there if I needed anything. As it turned out, we didn’t need any new bits. 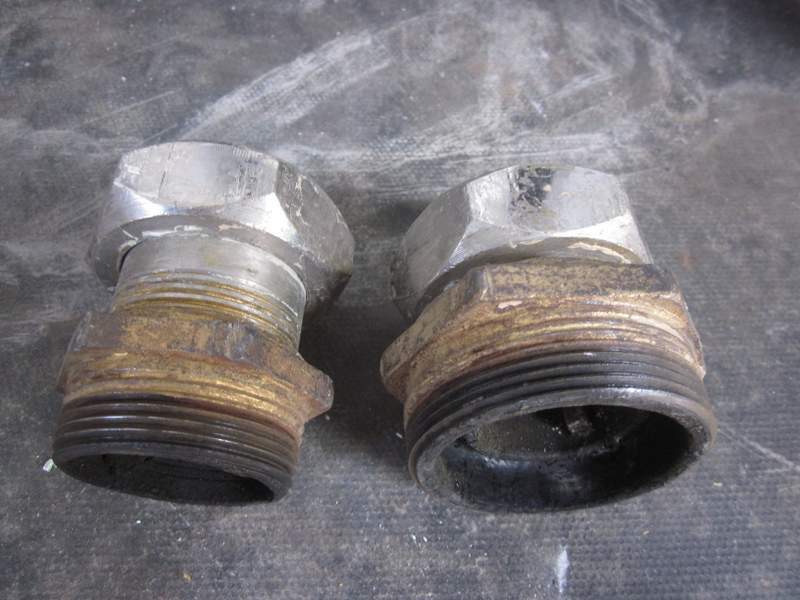 The fittings all came apart in good condition. Some of them weren’t too keen on unscrewing, but they were persuaded by the sight of a three-foot length of pipe on the end of my pipe wrench. I cleaned the decades of paint off the fittings, cleaned and wire brushed the threads, and made sure the internal contact surfaces were clean. 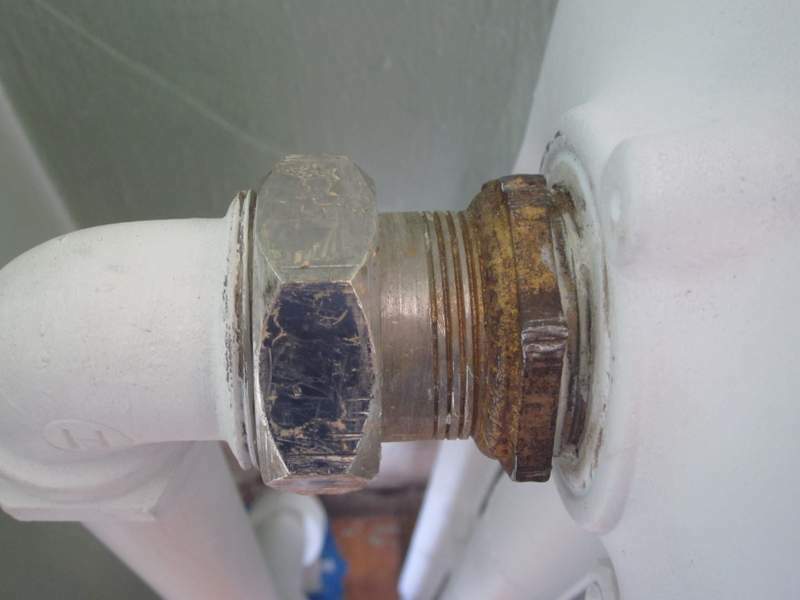 Thread paste was applied, and the fittings were screwed into the ‘new’ radiator. 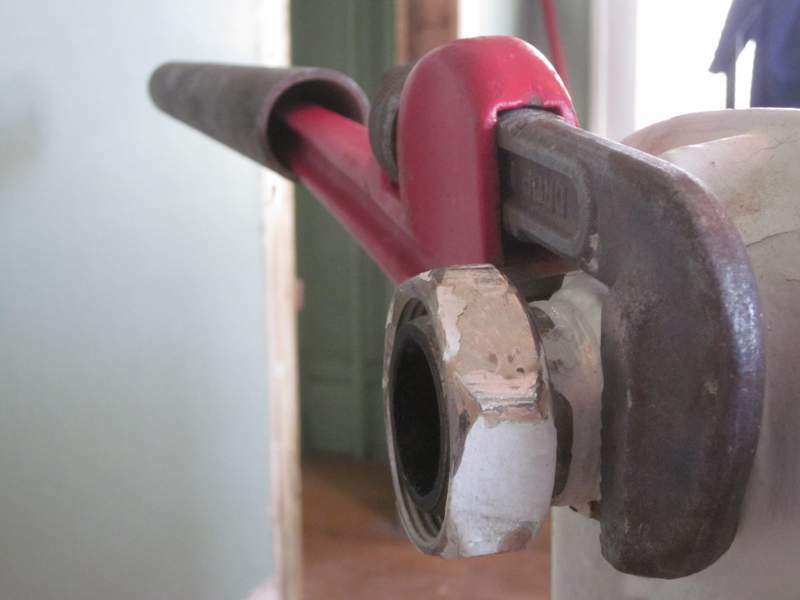 The pipe wrench, with its three-foot extension, was used to tighten the fittings as far as possible. The radiator was moved into place. It took a little bit of fiddling around with a crowbar to line up the fittings, but once in place, the collars on the fittings easily screwed onto the inlet and outlet pipes. Tightening up the collars pulled the radiator into position, and again, the extended pipe wrench finished the job. I refilled the system and turned the boiler on. The first time I checked the ‘new’ radiator, there was a very small amount of water underneath the top fitting. Here we go, I thought. Now I’m going to have to re-drain the system, undo the fitting and work out how to stop it leaking. This, I thought, is going to take ages and become really annoying. But, to begin with, I thought I’d see if I could stop the leak by tighten the fitting a bit more. I was able to turn it a very small amount, about 20º or 30º. Then, I stood back and waited. Nothing happened. It didn’t leak any more. I still go in there and check for leaks every half-hour or so. But it’s been three hours now and it’s still dry. Wait a minute while I go check it again…yep, still dry. Et, voila! New radiator in situ. And that was it. At no point was there any reason to get even slightly annoyed. I think this is a first for us. 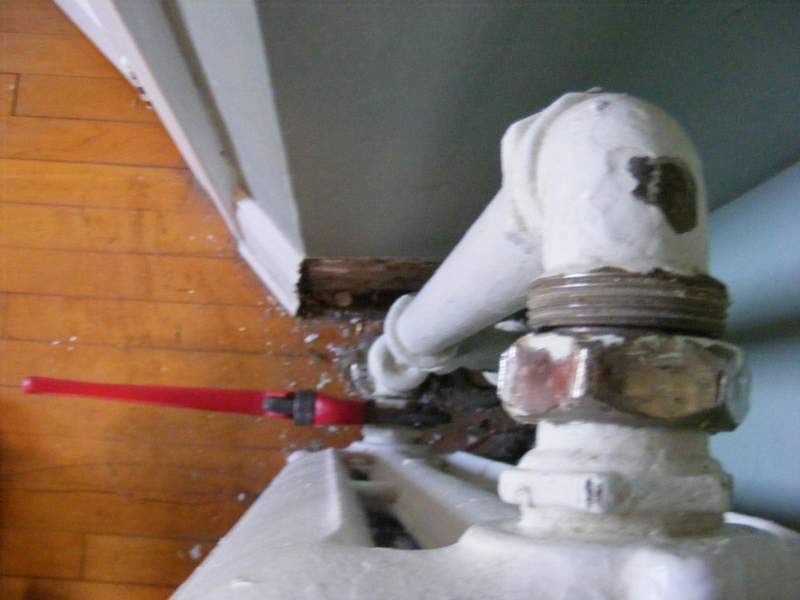 This entry was posted in Before & After, D'oh!, Plumbing. Bookmark the permalink.